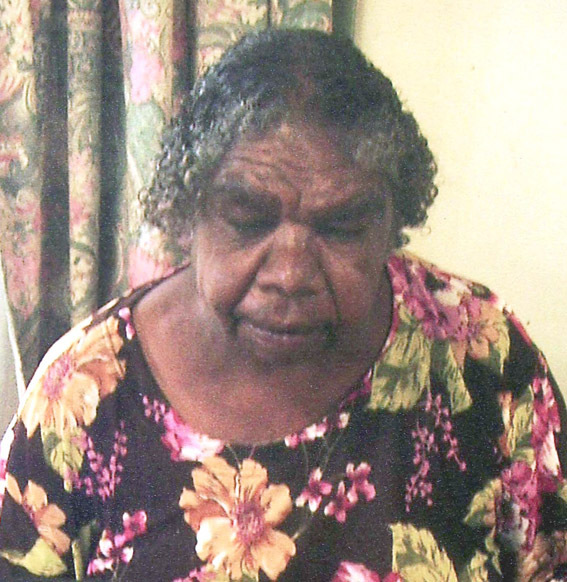 Mary Dixon Nungarrayi comes from the Yamunturrugu (Mt Liebig) region located in Central Australia, Northern Territory, and belongs to the Warlpiri language group. Mary was born near Town Bore Creek east of Papunya and commenced painting in the mid 1980s for Papunya Tula Artists. She and her former husband, Colin Dixon Tjapanangka, often collaborated on each other’s paintings. Mary Dixon and Goodwin Kingsley Tjapaltjarri (now deceased) lived and produced art in Alice Springs. She paints various Dreamtime stories. Selected Exhibitions: 1986 Editions Gallery, Fremantle; 1987 Blaxland Galleries, Sydney; 1987 Art Gallery of South Australia, Adelaide; 1988 Gauguin Museum, Tahiti; 1988 Chapman Gallery, Sydney; 1992 Basel, Switzerland; 1992 Tingarri Gallery, Melbourne; 1993 Art Gallery of Western Australia, Perth; 1998, 1999 Chapel off Chapel Gallery, Melbourne; 2000 Araluen Arts Centre, Alice Springs. Selected Collections: Art Gallery of South Australia, Adelaide; Holmes à Court Collection, Perth; City Art Gallery, Wollongong; Artbank.